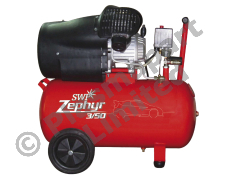 Huge 14CFM displacement, long lasting oil lubricated cast iron pump, and 2200w induction motor. With plenty of air to run any of our plasma cutters easily, this compressor is capable of running most air tools and spraying if required. 1 Year warranty is standard on this compressor. Fitted with tank pressure and regulated pressure gauges, and PCL female connections. A fantastic value good quality compressor. There is a £20+vat shipping charge on this item.